These areas were decided through a participatory process with residents and community groups. We developed our first report with indicators to measure York’s progress towards dealing with these key human rights issues in December 2016. On 7th December 2017, we released our second report reporting on progress and challenges. We held a public meeting to discuss findings of the 2018 report on 10th December 2018; this special edition includes extra information on the right to housing. You can view the preliminary findings here. We are excited to announce a new project for 2019. Working with York Independent Living Network, we are developing a user-led forum for residents of York who identify as disabled, and for their carers and allies. By disabled people we refer to the social model and include a broad range of issues, i.e. mental health, learning difficulties, physical, sensory and other impairments, chronic illness and other health related issues. By informal carers we refer to friends or family members that provide an unpaid caring/support role. By allies we mean anyone who is committed to achieving disability equality and inclusion and recognises the everyday struggle disabled people face. The forum will operate using the social model of disability – this recognises that people are disabled by the way that society is organised, and seeks to remove barriers to inclusion. We would love to hear from individuals and organisations who would like to be involved in developing or joining the forum. 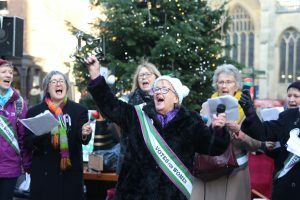 In 2018 we celebrated the centenary of the first women in the UK getting the vote, and York Women’s Forum began. We are proud to support the forum, and some of our volunteers recently completed a survey that will inform the direction and priorities for the forum. You can download the report here. Our schools project has gone from strength to strength. After a successful launch of oversubscribed termly workshops, we have been expanding our efforts. We continue to work the Independent State School Partnership and University of York Volunteering to engage young people. Last year we added Peace Jam York and York Archives to the list of organisations we work with to reach and engage young people. and encourage them to take action at their schools and in their communities. 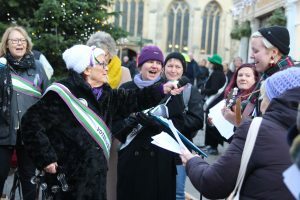 Since the autumn of 2016, we have worked with York Independent Living Network, York Explore and other organisations to develop awareness of Disability History Month (November to December) and the UN International Day for People with Disabilities (3rd December). 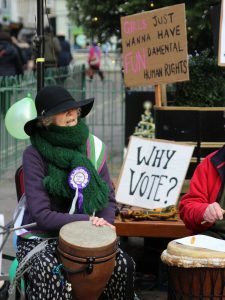 UK Disability History Month (UKDHM) is an annual event, running since 2010, that works to create a platform for focus on the history of disabled peoples struggle for equality and human rights. International Day of Disabled People is a day observed by the United Nations. This started in 1992, by United Nations General Assembly resolution (47/3). Its aim is to promote an understanding of disability issues and mobilize support for the dignity, rights and well-being of disabled people. It also seeks to increase awareness of gains to be derived from the integration of disabled people in every aspect of political, social, economic and cultural life. 2018 saw a larger organising group than in previous years, and the programme was generously supported by The Hungate Fund, through Two Ridings Community Foundation. 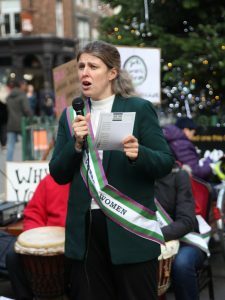 The programme included over twenty events, including a Goalball Tournament, a live-link to Urbino for the Eleanor Worthington Art Prize award, and a workshop on the effects of changes to the welfare benefits system on disabled people. Last year (2017) among other activities, we ran a community event on Direct Payments and a weekend of events under the banner of Disability Pride attended by close to 200 people. 2016’s theme looked at Disability and Art. If you would like to get involved in 2019, please send us an email. A basic requirement of human rights is that people are involved in decisions affecting them, but too often groups and individuals are unable to participate in consultations about the future of the city or their communities. The Community Voices project aims at engaging hard-to-reach members of the community, asking them what their priorities are, and what issues affect them. 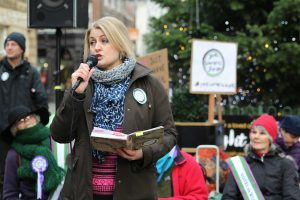 The Community Voices project, sponsored by City of York Council, runs until September 2019, and is currently focusing on hate crime. Hate crime is severely under reported in York. We worked with partners at NYP and York Racial Equality Network to investigate why this is, and what can be done to improve hate crime reporting mechanisms. Click here to read a report commissioned by York: Human Rights City, in collaboration with students at the Centre for Applied Human Rights. This was released following a workshop on hate crime in May 2015 which brought together community groups, police, businesses and Council.